I showed the problems with amiodarone for both live patients and dead patients in Part I. The higher the quality of the evidence, the less the evidence supports the use of amiodarone on humans. Amiodarone is all sales pitch and no medical benefit, but Dr. Kudenchuk keeps trying to spin the results like an acupuncturist, when the evidence clearly does not support Dr. Kudenchuk’s claims. What else should be de-emphasized? Now, the goalposts have shifted, again, and the claims are that some other dosing is safe and effective, even though the evidence to support these claims does not exist. This is alternative medicine. This is dishonest. This is experimenting on patients without any kind of ethical approval, or collection of data, or anything else that would accompany a true experiment. We are learning that we are very good at lying to ourselves, but we knew that. Eventually, we may be claiming that we have not studied what happens when we stand on one leg while giving epinephrine. How can we possibly stop using adrenaline if we have not proven that it doesn’t work when standing on one leg? How can we refuse to provide this one legged hope to patients? We are sorry for what we did to your _______, but we consider justifying doing something harmful, based on low quality evidence and even lower quality excuses, to be more important than the outcomes of our patients. If we don’t throw in the kitchen sink, how can we claim that we did everything we could for to your _______? I modified the original to add the outcomes reported by PARAMEDIC2. Severe neurological impairment is the wording from the conclusion, but that would not fit. If you think that harm is not an accurate synonym for impairment, you may be dangerous to patients. If the next revision of ACLS/ILCOR (Advanced Cardiac Life Support/International Liaison Committee on Resuscitation) does not state that epinephrine/adrenaline should be limited to use in high quality research, it will be encouraging abuse of patients. This is alternative medicine. This is not medicine. The difference is that real medicine relies on valid evidence that it works, while alternative medicine relies on marketing strategies and misinformation. Do you want to be treated by someone who can tell the difference between these approaches? Medicine requires doing what is best for the patient. Alternative medicine requires doing what makes the guru look best, so that the guru can keep making sales. The doctors promoting this unethical approach do not appear to be ashamed of what they are doing, but they keep making excuses. We need to make it clear that their excuses are not ethical. To all of the doctors claiming that a drip works. Demonstrate that you are ethical and competent. Show that what you are doing improves outcomes that matter to patients, in a high quality study, or stop. If doctors won’t do that, maybe we should add DNA (Do Not Amio) and DNE (Do Not Epi) to our list of advance directives, for those who do not think that resuscitation to a come, where sepsis and aspiration pneumonia are what we aspire to. Kudenchuk PJ, Brown SP, Daya M, Rea T, Nichol G, Morrison LJ, Leroux B, Vaillancourt C, Wittwer L, Callaway CW, Christenson J, Egan D, Ornato JP, Weisfeldt ML, Stiell IG, Idris AH, Aufderheide TP, Dunford JV, Colella MR, Vilke GM, Brienza AM, Desvigne-Nickens P, Gray PC, Gray R, Seals N, Straight R, Dorian P; Resuscitation Outcomes Consortium Investigators. CONCLUSIONS Overall, neither amiodarone nor lidocaine resulted in a significantly higher rate of survival or favorable neurologic outcome than the rate with placebo among patients with out-of-hospital cardiac arrest due to initial shock-refractory ventricular fibrillation or pulseless ventricular tachycardia. This trial shows that amiodarone and lidocaine offer hope for bringing patients back to life and into the hospital after cardiac arrest,” said principal study author Peter Kudenchuk, M.D. This trial shows that amiodarone and lidocaine offer no hope for outcomes that matter to patients. 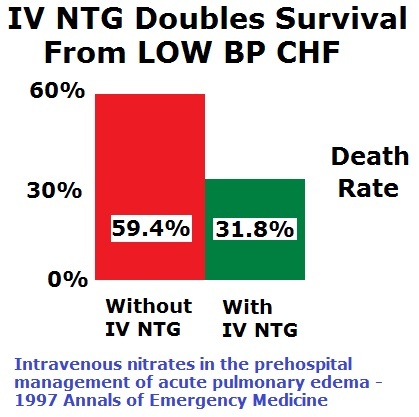 We observed an interaction of treatment with the witnessed status of out-of-hospital cardiac arrest, which is often taken as a surrogate for early recognition of cardiac arrest, a short interval between the patient’s collapse from cardiac arrest and the initiation of treatment, and a greater likelihood of therapeutic responsiveness. Though prespecified, this subgroup analysis was performed in the context of an insignificant difference for the overall analysis, and the P value for heterogeneity in this subgroup analysis was not adjusted for the number of subgroup comparisons. Nonetheless, the suggestion that survival was improved by drug treatment in patients with witnessed out-of-hospital cardiac arrest, without evidence of harm in those with unwitnessed arrest, merits thoughtful consideration. The best that can be stated about these drugs is that if the researchers used a large enough study, they might be able to find a statistically significant result – or the researchers may demonstrate that this was just another example of a statistically insignificant run of luck, which means nothing and is just as likely to have gone the other way. A run of heads in a row, while flipping a coin is a reason to examine the coin for bias, but if no bias is found, it is expected to be just what is expected to happen in a large number of coin flips. A lack of understanding of coincidence leads to faulty conclusions. The difference in outcomes, that Dr. Kudenchuk claims is significant, not statistically significant. Does Dr. Kudenchuk not understand the way research works or does Dr. Kudenchuk have some unstated motive for distorting the results? It appears that the New England Journal of Medicine refused to publish the conclusion that Dr. Kudenchuk wanted, so Dr. Kudenchuk is using more gullible people to spread his misinformation. Go ahead and read the full paper, which is available from NEJM here. Also read Dr. Kudenchuk’s press release, which misrepresents the results of Dr. Kudenchuk’s study. You would think that Dr. Kudenchuk would know better. I have nothing to hide. I want you to look all of the evidence. The results do not show an improvement in the any outcome that matters to patients. It appears that the full text of PARAMEDIC2 is no longer available for free from NEJM, but there is the option of registering for 3 free papers a month (Register for 3 FREE subscriber-only articles each month.) in a red pop-up banner at the bottom of the page. Once again, the results do not show an improvement in the any outcome that matters to patients. EM (Emergency Medicine) and EMS (Emergency Medical Services) have already started to eliminate/decrease use of a lot of our failed treatments, because people started to see through our excuses. Atropine for asystole stuck around for a long time, then just vanished.. Calcium for cardiac arrest is also something that used to be standard of care, then we raised our standards. We need to keep raising our standards, because our patients’ outcomes – their lives, their brains, their everything – depend on raising our standards. We used to give antiarrhythmics to almost anyone with a cardiac complaint. Then there was CAST (The Cardiac Arrhythmia Suppression Trial). While CAST did not study lidocaine, it did study longer term use of antiarrhythmics. Lidocaine is too dangerous for long term use, so the results of CAST may be much worse for lidocaine. We thought that the increased deaths among patients with frequent PVCs (Premature Ventricular Contractions) after having a heart attack was due to a problem with the conduction system. PVCs indicate a problem with conduction and antiarrhythmics cause the PVCs to go away. Before receiving the antiarrhythmic (PVCs are circled in red). Now the problem is, How do we get paid more? These drugs were the biggest selling drugs at the time. They making the drug companies a fortune. Whichever company made the drug that saved the most lives would make a lot more money then the others. Provide evidence that ______ saves more lives than all of the others. The problem of the PVCs was solved, but the solution was killing many more patients than not giving drugs. The result was not celebrated by the drug companies. The patients taking antiarrhythmics were dying at three times the rate of the patients taking placebos. A plausible physiological mechanism suggested the drugs would save lives, but that was based on an assumption that was not justified. This is the kind of reasoning that appeals to those who reject EBM (Evidence-Based Medicine). The evidence should convince these EBM opponents of the folly of relying on physiology and on a plausible explanation to justify not looking for the evidence that might expose their unreasonable assumptions. These otherwise reasonable people start making excuses for unreasonable assumptions, because they believe. They seem to need to convince others to join in and multiply their mistakes. The PVCs appear to have been just an indicator of an unhealthy heart. Getting rid of the PVCs may have made the conduction in the heart less healthy. Giving the drugs may have killed tens of thousands of patients. Antiarrhythmic use decreased dramatically after the harm demonstrated in CAST, but some drug pushers are trying to get one of the worst antiarrhythmics (amiodarone, now in a new formula) to make a comeback, by creatively spinning research to claim results the research was never designed to evaluate. Though prespecified, this subgroup analysis was performed in the context of an insignificant difference for the overall analysis, and the P value for heterogeneity in this subgroup analysis was not adjusted for the number of subgroup comparisons. Nonetheless, the suggestion that survival was improved by drug treatment in patients with witnessed out-of-hospital cardiac arrest, without evidence of harm in those with unwitnessed arrest, merits thoughtful consideration. Amiodarone has also been shown to be horrible for patients with ventricular tachycardia with a pulse. Amiodarone is so ineffective, that the rate of severe side effects is greater than the rate of improved outcomes. Amiodarone is more likely to make your patient’s medical condition much worse, but it is still considered to be the standard of care and amiodarone is still in EMS protocols. Maybe amiodarone can produce better results if it is used for execution by lethal injection. I am expecting that there will be more failed treatments removed from our standards of care. We need to raise our standards to improve outcomes, not lower our standards to make us look better than we are. Continued in Part II. I will add Part III and others at some point and provide the links here. Why Did We Remove Atropine From ACLS? Since Mike cites the original parachute study, as if it is not satire, it is amusing to point out that there is a new Parachute Study! Read Dr. Radecki’s description of this satirical poke at those who do not understand research in the satire issue of the BMJ, which they put out every Christmas as sort of a British IgNobel. Don’t Bother With the Parachute! Parachute use to prevent death and major trauma when jumping from aircraft: randomized controlled trial. Yeh RW, Valsdottir LR, Yeh MW, Shen C, Kramer DB, Strom JB, Secemsky EA, Healy JL, Domeier RM, Kazi DS, Nallamothu BK; PARACHUTE Investigators. BMJ. 2018 Dec 13;363:k5094. doi: 10.1136/bmj.k5094. Erratum in: BMJ. 2018 Dec 18;363:k5343. Free Full Text from BMJ. Free Full Text from European Heart Journal. Amiodarone or procainamide for the termination of sustained stable ventricular tachycardia: an historical multicenter comparison. Marill KA, deSouza IS, Nishijima DK, Senecal EL, Setnik GS, Stair TO, Ruskin JN, Ellinor PT. Acad Emerg Med. 2010 Mar;17(3):297-306. Free Full Text from Academic Emergency Medicine. Amiodarone is poorly effective for the acute termination of ventricular tachycardia. Marill KA, deSouza IS, Nishijima DK, Stair TO, Setnik GS, Ruskin JN. Ann Emerg Med. 2006 Mar;47(3):217-24. Epub 2005 Nov 21. Intravenous amiodarone for the pharmacological termination of haemodynamically-tolerated sustained ventricular tachycardia: is bolus dose amiodarone an appropriate first-line treatment? Tomlinson DR, Cherian P, Betts TR, Bashir Y.
Emerg Med J. 2008 Jan;25(1):15-8. Effects of intravenous amiodarone on ventricular refractoriness, intraventricular conduction, and ventricular tachycardia induction. Kułakowski P, Karczmarewicz S, Karpiński G, Soszyńska M, Ceremuzyński L.
Low doses of intravenous epinephrine for refractory sustained monomorphic ventricular tachycardia. Bonny A, De Sisti A, Márquez MF, Megbemado R, Hidden-Lucet F, Fontaine G.
World J Cardiol. 2012 Oct 26;4(10):296-301. doi: 10.4330/wjc.v4.i10.296. As part of a study to find out if epinephrine (adrenaline in Commonwealth countries) is safe to use in cardiac arrest, a patient was treated with a placebo, rather than the inadequately tested drug. Some people are upset that the patient did not receive the drug they know nothing about. The critics are trying to make sure that we never learn. We need to find out how much harm epinephrine causes, rather than make assumptions based on prejudices. When used in cardiac arrest, does epinephrine produce a pulse more often? When used in cardiac arrest, does epinephrine produce a good outcome more often? In over half a century of use in cardiac arrest, we have not bothered to find out. We did try to find out one time, but the media and politicians stopped it. We would rather harm patients with unreasonable hope, than find out how much harm we are causing to patients. We would rather continue to be part of a huge, uncontrolled, unapproved, undeclared, undocumented, unethical experiment, than find out what works. Have we given informed consent to that kind of experimentation? The good news is that the enrollment of patients has finished, so the media and politicians will not be able to prevent us from learning the little that we will be able to learn from this research. Will the results tell us which patients are harmed by epinephrine? Probably not – that will require a willingness to admit the limits of what we learn and more research. What EMS treatments have been demonstrated to improve outcomes from cardiac arrest? 1. High quality chest compressions. All other treatments, when tested, have failed to be better than nothing (placebo). PARAMEDIC2 has finished recruitment and we are therefore no longer issuing ‘No Study’ bracelets. The data collected from the trial is in the process of being analysed and we expect to publish the results in 2018. Once the results have been published, a summary will be provided on the trial website.